NEW YORK—After a 10-year-old girl drowned at Coney Island beach Tuesday evening, Brooklyn Borough President Eric Adams and Council member Mark Treyger called on the city to make water safety education mandatory in all public schools and for more park officers to be deployed at the beach. On Tuesday at around 7 p.m., good Samaritans pulled Takara McDuffy and her 9-year-old sister out of the water at a Coney Island beach after seeing them in distress. Witnesses saw them playing on a jetty prior to entering the water, but police could not confirm whether they fell in or went into the water on their own accord. Takara’s sister was found conscious, while Takara was sent to the Coney Island Hospital, where she died. The medical examiner’s office ruled the death as an accidental drowning. There have been six drowning deaths in the city since mid-June this year, four of them in Brooklyn and two in the Bronx. Previously, a 2-year-old girl drowned in a lake in Prospect Park and two 13-year-old boys drowned in the Bronx River. In 2012, the latest available data from the city health department, there were 17 deaths due to drowning. “That should not be a summer tradition, reading about young people who died in drownings,” said Brooklyn Borough President Eric Adams at a press conference held at the Coney Island boardwalk on Wednesday. He announced that he is working with state Sen. Diane Savino to pass state legislation requiring water safety and swimming lessons for all public school children, beginning in the second grade. He estimated that it would cost around $150 per child to fund the program, but has yet to determine where the money would come from. He also wants all police and city employees to be trained in CPR so they can rescue those in danger. Council member Mark Treyger noted the shortage of park officers to patrol the 2.5 miles of beaches at Coney Island. He said the officers could remind people that lifeguards are off duty after 6 p.m. and check for people swimming in the water after hours. Park rules prohibit people from swimming when lifeguards are off duty. Adams said he would look into the possibility of extending lifeguard hours to after sunset. Morty Berger, founder of NYC Swim, a swimming events organizer, said that while these recommendations were all good suggestions, the responsibility falls on parents and adults to keep watch on their children and make the right decisions about swimming in the waterways. “Ultimately, ownership for one’s behavior relies on the individual,” he said. “No amount of signage is going to counteract lack of common sense,” noting that people often fail to read signs carefully. He applauded Adams’s suggestion to teach more children how to swim. “Swimming used to be mandatory in high school and in college, but since the late ’70s, colleges started not requiring it. 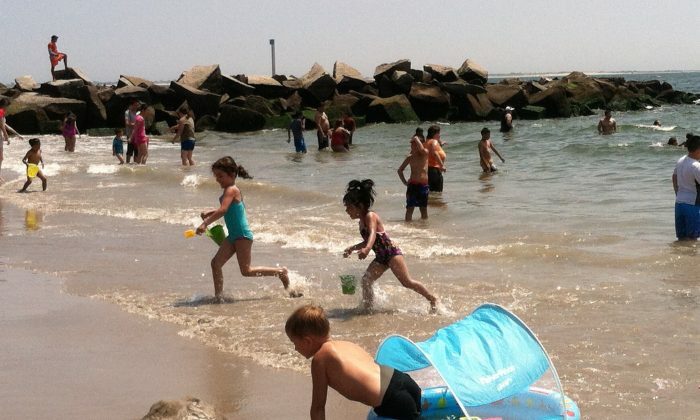 We have a whole generation of kids who don’t know how to swim,” Berger said. A 3-year-old child was injured after falling of a roller coaster in Brooklyn’s Coney Island, located in New York City.